In February 1998, the journal Australasian Science carried an article by environmental biologist David Booth warning ‘that scientific creationism is making unwelcome inroads into the education system’. This widespread misconception, that much of practical science becomes impossible without belief in evolution, is only one of the many myths which readers can counter using Creation magazine. For example, compare Booth’s statement above with the interview involving a French scientist heavily involved in government research on similar questions. This geneticist is only one of many who believe in six-day creation, and he is convinced that evolutionary theory is of absolutely no practical value to his work whatsoever. This is one of the main reasons we routinely feature articles on qualified, practising scientists who are creationists, in a vast array of fields. It helps readers to be able to easily counter the common fallacy that belief in evolution has something to do with real, practical science that works. Associated with this is the myth, adhered to by perhaps the majority of educated people today, that one can ‘see evolution happening’ today. Biologists like Booth, when they see changes such as adaptation through natural selection, etc. think they are ‘seeing’ the same process which allegedly turned fish into philosophers, for example. Thus, until the fallacy in this belief is explained to them, it is no wonder that they see evolution-rejecting Christians as ignorant fanatics denying a ‘fact’ which they can see with their own eyes. 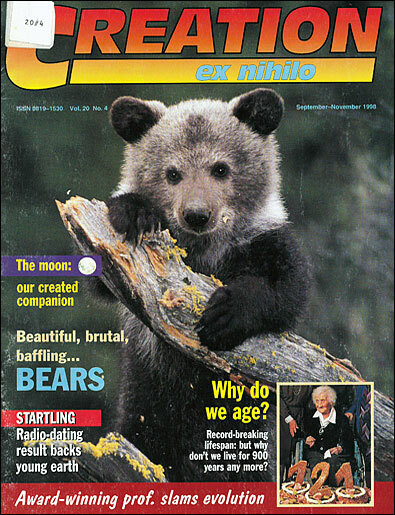 This is why it is so important for us to try to include, in each issue of the magazine, something which you can use to correct such misconceptions—preferably, something which not only informs, but is enticing to read, such as the article on bears with its brilliant photography. This presents the facts of adaptation and natural selection within a thoroughly biblical way of thinking about the history of life. Even more exciting is this: Not only do observations of the changes in living things not demand an evolutionary interpretation, but they actually generate a huge problem for mega-evolutionary belief, once the crucial ‘information factor’ is taken into account (see also Weasel Words). A point of irony in all this comes from an earlier part of Booth’s article, in which he complains that many Australian university biology curricula ‘pay no more than lip service to evolution’. The reason, says Booth, is the ‘move to a more utilitarian science’ which demands ‘more practical benefits from science’. So Booth admits that, in response to pressure to get more practical scientific results, universities are moving away from spending time on evolutionary theorising. This hardly supports his claim in the same article that evolution is ‘of great practical relevance’ to science! Enjoy this magazine, but please—don’t keep this information to yourself. It’s just far too important. Booth’s claim is moderate compared to some of the inflammatory rhetoric (designed for public consumption) from the extreme wing of anti-creationism in Australia. One flamboyant atheistic crusader, widely regarded as obsessed with the issue (and lauded by some prominent churchmen), claims that all modern science, technology, medicine, etc. would be impossible if biblical creation were true! Return to text.